The roots for Dig IN date back to 2008, when an Alice Waters event at the IMA inspired local Ivy Tech instructor Thom England and local celebri-chef Neal Brown (Libertine, Pizzology, L’Explorateur) to dream up the Taste of Indiana farm-to-fork festival to promote Indiana’s Slow Food scene and its constituents. 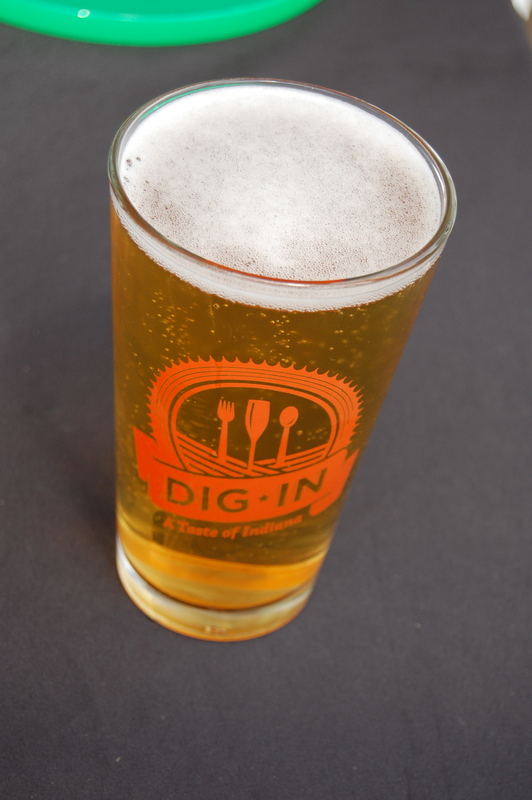 The name transitioned to Dig IN in 2009, and the rest is history. The 2012 roster yesterday took in some 30 chefs, several dozen producers, a handful of food trucks, microbreweries, wineries, artisan vendors and live entertainment. This was one big par-TAY for foodies. 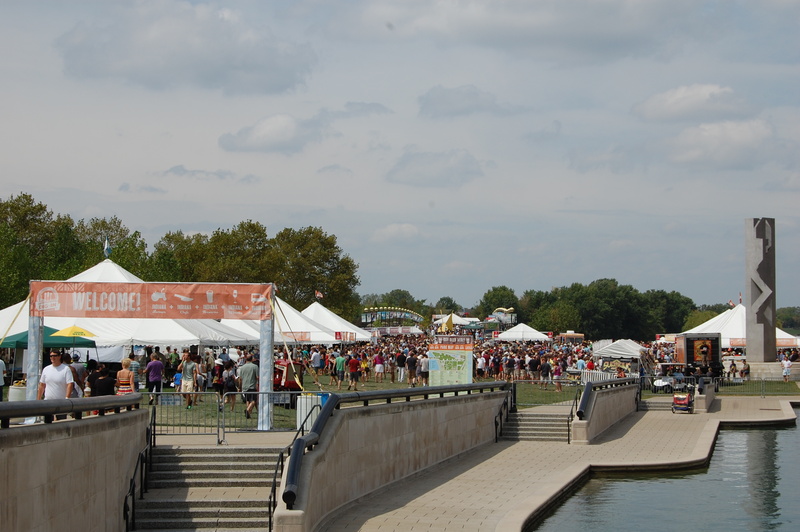 Here’s how it works: when you enter, you get a food “passport” that basically gives you the lay of the land — who’s in what tent, what they’re serving, where to find the beer and wine, food truck row, Indiana food artisans, etc. You figure out what you want to taste based on the item descriptions, or the chef’s reputation, and hop in line to score your sample. The lines were a little intimidating at first, but we were reassured to see them moving quickly, and I don’t think we had to stand anywhere for longer than a few minutes waiting for food. Between the two of us, we made our way through nearly a dozen lines. Overall impressions, there was a lot of corn to be had here, and a lot of pork. This is not necessarily a bad thing, but made for some overlap among the offerings. 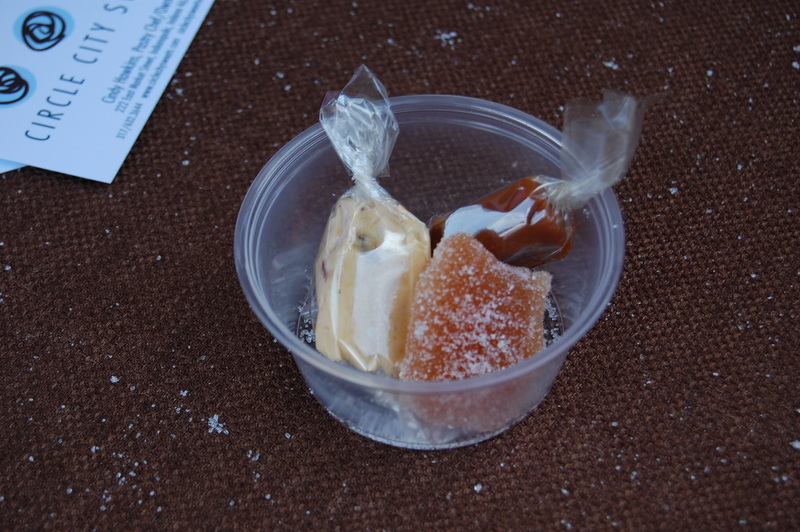 Also, although there were several fruit-based soups, I didn’t see a whole lot of dessert options. Would have loved a tiny bite of cake, brownie, pie, whatever to finish things off. I suppose in retrospect I could have just stocked up on 240Sweet marshmallows and Frittle’s Candy. First up, we jumped in the 18 on the Square line for a mini bison bratwurst with handcrafted mustard and a pickled corn/squash relish. It was a nice-sized sample and a great way to kick things off. 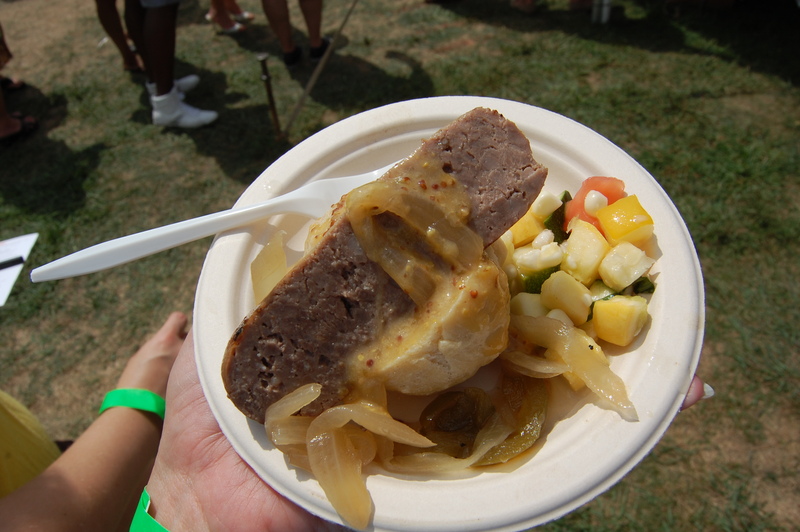 The brat had good flavor, and the relish was a tangy vinegary counterpoint to cut the richness. I don’t know anything about Chef Joseph Martin, but I’m going to put this restaurant on my radar if I’m ever down around Shelbyville. 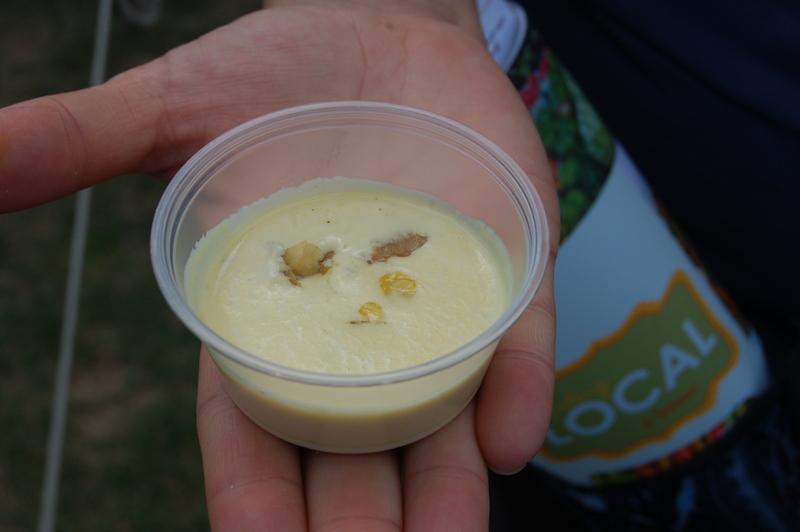 ricotta with peach corn puree and popcorn from Zest! and Just Pop In! 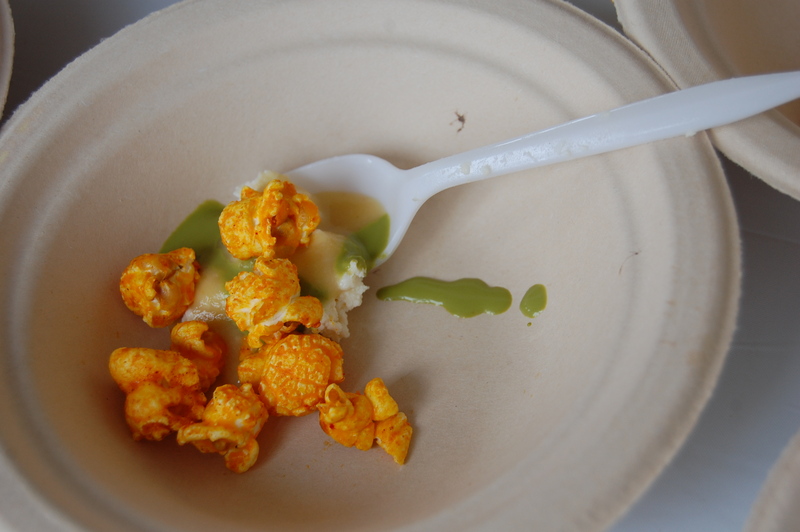 A line or two over, we tried the housemade ricotta with peach and white corn puree topped with Twisted Sistaz Popcorn. This one was a team effort between Zest! Exciting Food Creations and Just Pop In!, (perhaps they joined forces because both feature exclamation marks in their names?) It pains me to say this, because I love Zest and the eatery is one of my brunch go-tos, but I did not like this dish. I’ve been wanting to try my hand at making ricotta at home, and was hoping to get some indication of how it might turn out, but I couldn’t taste it at all underneath the puree. There was also a little splash of something green (arugula?) that just didn’t do anything for me. The popcorn was good, but seemed a strange garnish, and with all the other flavors going on, I couldn’t discern the spices and curry in it. Sun King Sunlight Cream Ale. Ahhhhh…. It being a near-90-degree day and all, we decided a cold beer was definitely in order. Options abound; you can load up on small free samples, or purchase a take-home pint glass for $6 that includes one fill (additional refills are $5 a pop). $6 for a souvenir glass and a beer is a good deal in my book. I suppose I could have tried something new, but I decided to support my buddies Clay and Dave and beelined straight to the Sun King line for a pint of Sunlight Cream Ale. You really can’t go wrong with this beer on a hot summer day. Thirst quenched and ready for more food, Laura snagged a taste of chilled peach soup with a scattering of shredded duck and a radish slice on top from R Bistro and pronounced it tangy, fresh and delicious. 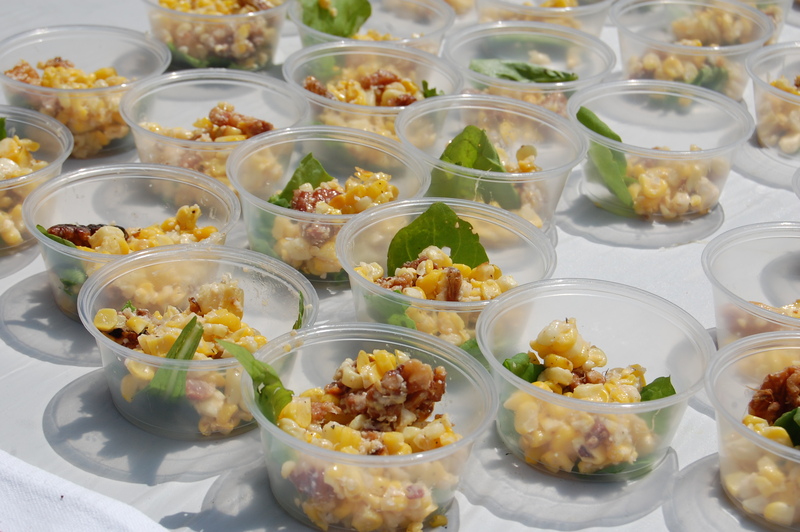 Combining the themes-of-the-day corn and pork, and doing it extremely well, Ryan Nelson and Late Harvest Kitchen offered a corn, walnut, goat cheese and pancetta salad. Fresh, crispy, creamy and flavorful. The pancetta really made this dish. Then again, bacon makes everything better if you ask me. Still can’t believe I haven’t been to eat at Late Harvest Kitchen yet. MUST get there. Soon. Laura wanted to say hi to her friend Mark Cox at Fermenti Artisan, who served a small scoop of fermented garden kraut with Capriole Farms Old Kentucky Tomme cheese. 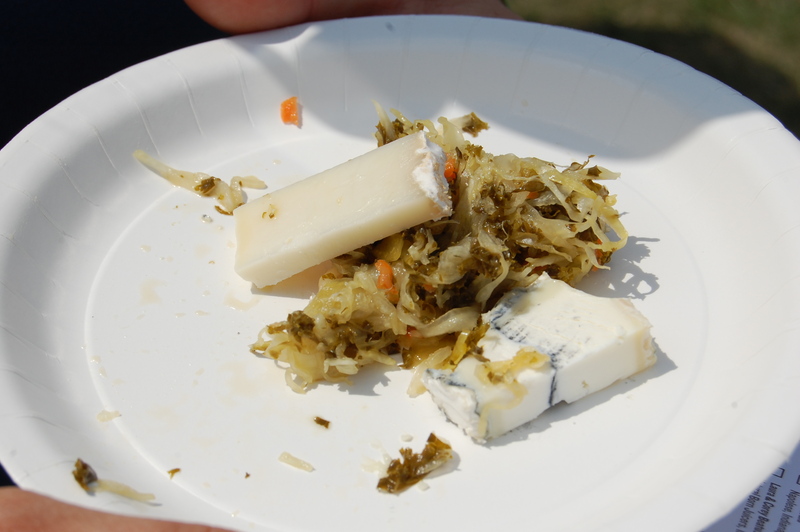 Laura loves her some sauerkraut, and said this was an especially good one. 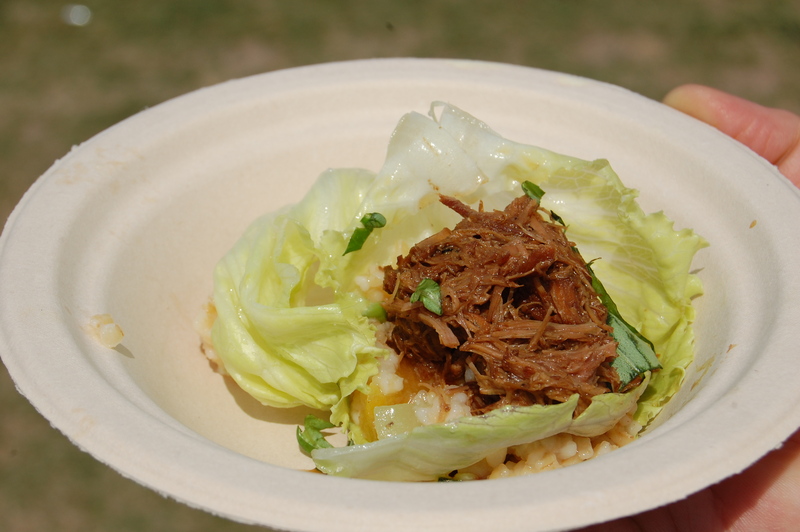 My personal favorite dish of the day came from Oakley’s Bistro – a lamb adobo lettuce wrap. O.M.G. was it good. The tender spicy, braised lamb with a little creamy grain underneath (still trying to figure out what this was – polenta? Cous cous?) and the fresh, crunchy lettuce was a perfect flavor/texture combination. I could have eaten several of these and called it a day. I’m ashamed to say I have never been to Oakley’s Bistro for a meal despite several strong word-of-mouth recommendations, and I must rectify this wrong. A ridiculous lapse of attention on my part. At this point, Laura and I took a little breather to sit down and drink some water, which brings me to another cool feature of Dig IN. The organizers and volunteers kept the free bottles of water coming the entire afternoon, dropping off cases to the entertainment tents and passing them out via golf carts. 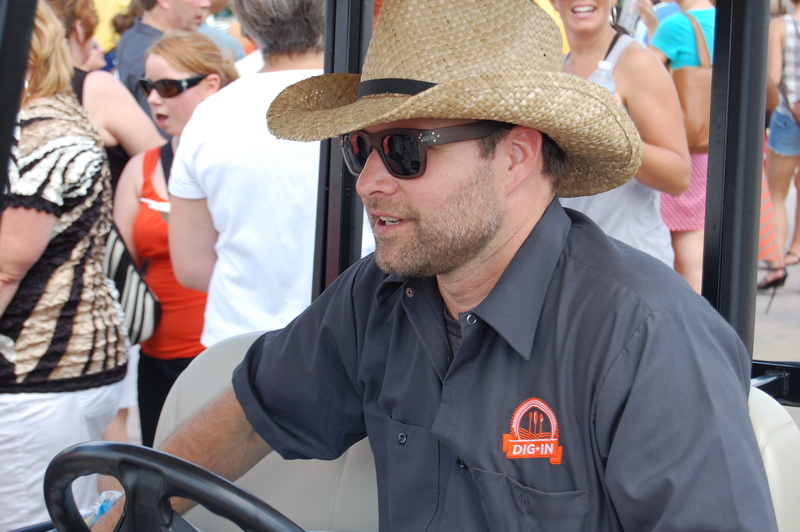 We even spied Neal Brown himself playing water boy, cruising through the crowds on his golf cart like a rock star. I’m surprised people didn’t stop him to get his autograph. Refreshed, we took a wander up to food truck row on the bridge over the White River. 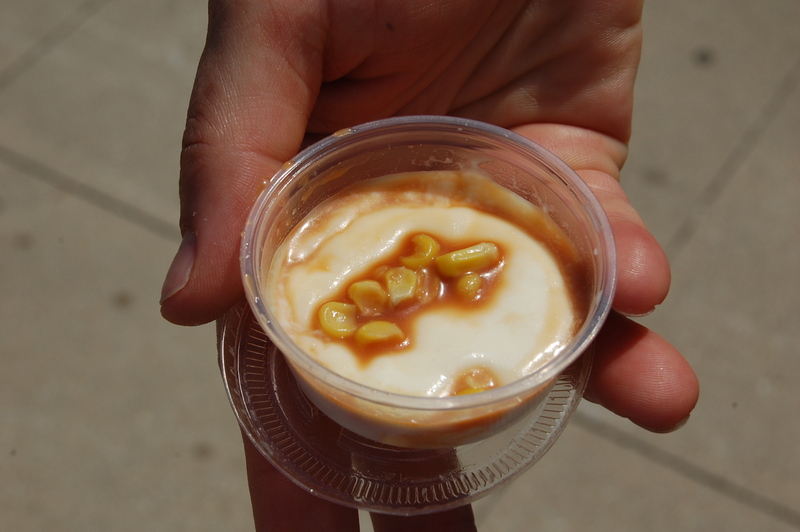 I wanted to try the sweet corn panna cotta with dulce de leche from Scratchtruck. Sadly, this one let me down. It could have been much better if it had been really icy cold and much firmer in texture. 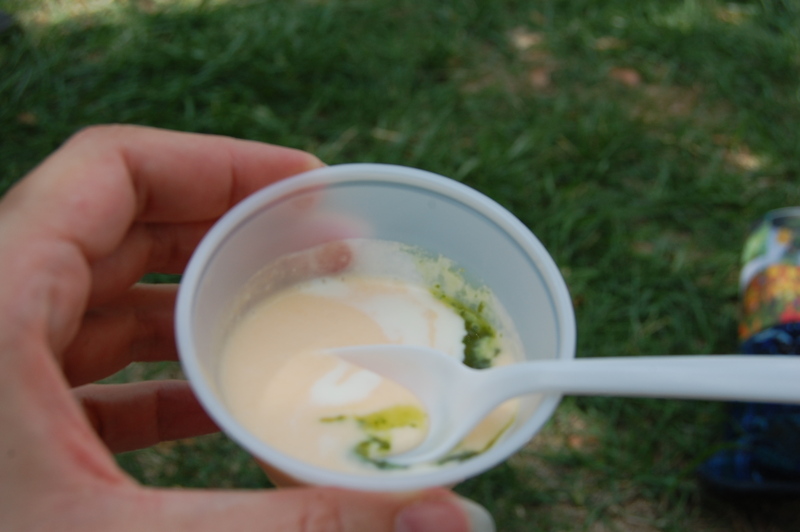 As it was, the temperature was on the warmish side, and the consistency was way too loose, almost like yogurt. I didn’t care for this at all, but I’m more than willing to give Scratchtruck another shot for a burger sometime, which I hear is stellar. Husband and wife Roger and Cindy Hawkins operated their respective Circle City Soups and Circle City Sweets booths side by side, just as they do their stands in City Market. (All together now…. awwwwww.) I love these folks. I actually had the pleasure of working with Roger when I was doing some temp catering several years ago at Puck’s at the IMA, and I recently interviewed Cindy for an article in the current issue of Edible Indy, so I’m thrilled to see them both doing well. 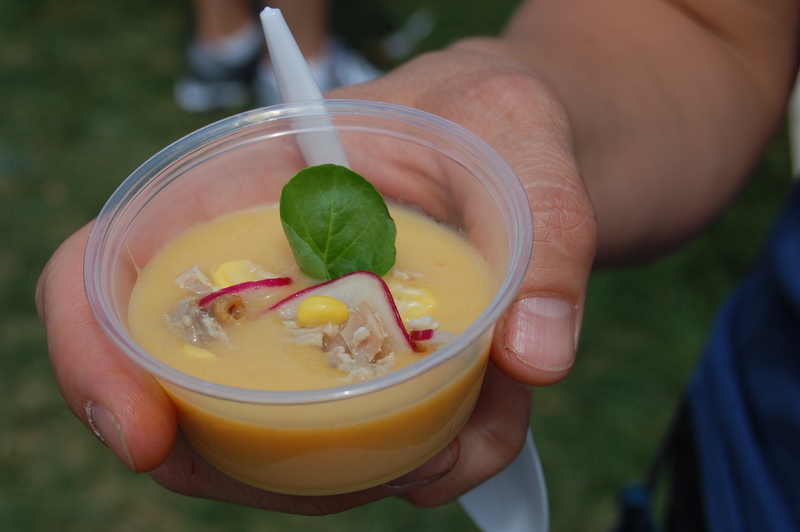 Roger is the soup master; for Dig IN, he ladled up his signature My Dad’s Sweet Corn Chowder. I don’t even want to know how much cream and butter go into this recipe, but if you’re looking for an insanely rich, delicious soup, Roger’s the man. I could take a bath in this stuff. It’s that good. If you happen to be in City Market, or catch him at a farmer’s market, do yourself a favor and pick up a pint or two. Laura wanted to keep going, but I was really hitting the wall and had to call it quits. She went on to try the cantaloupe cucumber soup with basil crème fraiche and watercress pistou from Meridian, and said it was like a light, refreshing sweet/savory smoothie; and the signature Reuben from Black Swan Brewpub, which she loved. With full tummies and happy hearts, we decided to call it a day and head home. My only suggestion on how to improve on Dig IN would be to extend it to two days, or even a full day. I don’t know if that’s even logistically possible, but there was just too much to see and sample here to cram into a couple hours without going into total gustatory overload. I really would have liked to eat more, but after so many samples, a pint of beer and a bottle of water, my belly felt like it was going to bust. In a good way. I loved, loved, fricking LOVED this event, and I’m already looking forward to coming back next year. I suggest you do the same.